When my oldest son was 15 months old, one day he arbitrarily and instantaneously decided that he hated anything green. Green beans, peas, asparagus, lettuce, broccoli, spinach... all refused. Red bell peppers? Fine. Carrots, cauliflower, and corn? No problem. It was infuriating. All those homemade organic purees I had made in his infancy only led to short-term success. His fondness of vegetables and appreciation for anything and everything edible had vanished. It was suddenly very easy to see why America is raising an entire generation of picky eaters. I even tested out my Green Hypothesis Dr. Seuss-style. I made him a pile of scrambled eggs, and on the other side of his plate, a pile of green eggs. The yellow pile was gone in less than 12 seconds; the green pile remained untouched. I did what any strong-willed, vegetable-loving, I'm-the-Boss, pediatrician-in-training mother would do: I waged war every single night at dinner time. I played airplane and choo choo train with his spoon. I bribed. I begged. I put cheese on top. I put whipped cream on top. I "hid" it in other foods. I forced it in his mouth. I made him sit at the dinner table for 2-3 hours at a time. The American Academy of Pediatrics, child psychologists, and parents the world over will tell you that basically none of these works, and some of these tactics will likely cause more harm than good. After working all day, I was so eager to see my boy, but every night without fail, my mood devolved, and my toddler's affinity for vegetables improved not one bit. For my sanity and my son's wellbeing, I had to figure out another way. This brings us to last week's discussion. Regarding children's behavior and motivation, I asserted that kids are most dramatically influenced by two factors: the actions of those close to them, and a craving for praise and affirmation. We briefly touched on the first item, and it's really quite intuitive. Kids are sponges, and they replicate nearly everything they see us do, for good or ill. The second factor--praise--is vastly underutilized in my opinion. I was listening to a pediatric podcast a few weeks ago... the topic was managing kids with severe behavioral problems. The author painted a picture that is probably familiar to all of us: bad behavior gets punished, punishment leads to sour attitudes, sour attitudes lead to more bad behavior, and everybody in the situation is unhappy. The recommendation was that 70-80% of direct interactions between parent and child be distinctly positive ones, otherwise the child will simply refuse to buy into the behavior modification plan. After hearing that statistic, I did what you are all probably doing right now: I asked myself, "What's my score?" Well, the answer for every parent ever is, "Depends on the day!" And that's what ties these two parenting anecdotes together. Remember last week when I bragged about my hiking-massaging-cooperating-obedient Wonder Kids? I was actually thinking about that podcast when I planned our outing. I chose an activity that would challenge them... too easy, and they could run wild; too hard, and they could crumble. I wanted something that would bestow a sense of pride upon completion. Pride begets confidence and self-worth, and I want to cultivate all of these in my children. I cheered for them on the steep parts. I marveled at them at the summit. I praised them on the descent and on the whole ride home. Positivity is contagious, and they spent the rest of the night trying to impress me and bless me. It was a very good day. Flashback to 5.5 years ago and the nightly woes with my pint-sized veggie hater. I may have been in pediatric residency becoming a supposed "expert" in kids' health, but I had zero extra minutes to read any parenting books, and I was in the very earliest stages of navigating How To Not Screw Up This Tiny Human. After weeks upon weeks of mealtime missteps, and hours upon hours of strategizing with my husband, we developed a plan. The first two tenets of our plan were (you guessed it): set an example, and set him up for success. More on that in Part III! The pain is temporary. 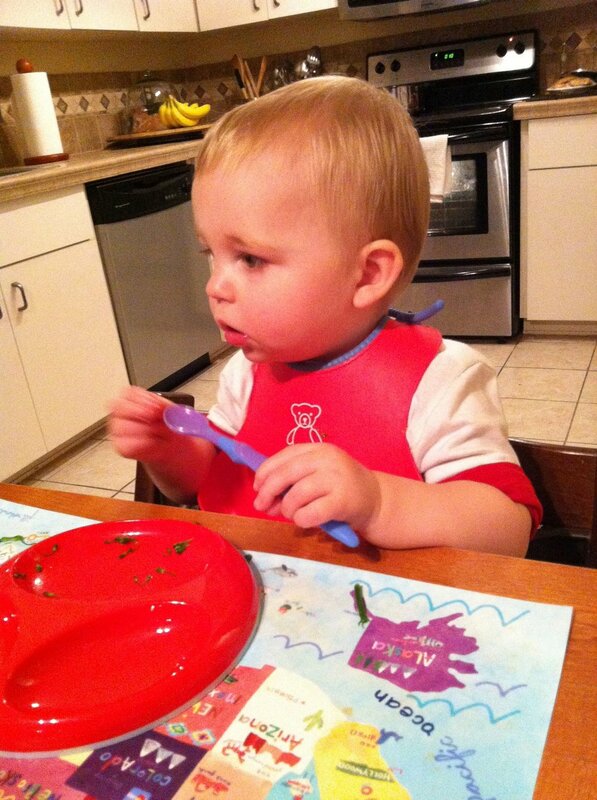 After graduating from Mommy and Papa's Vegetable University, here is Kid #1 eating his full portion of asparagus... signing for "more", and signing "please". Cover photo: Kid #1 at 4 years old, burglarizing my brussels.